Taylor Canfield of the US Virgin Islands met Britain's Ian Williams today in the 18th and last race of the second of the 50th Congressional Cup's double round-robin and the world's No.1-ranked match racer beat No.2 by 23 seconds, winning the privilege of picking his opponent in Sunday's semifinals. "I hope he picks us," said Williams, who matched Canfield's 13-5, record but lost the last race to him and with it the tiebreaker. Nevertheless, Williams said, "We're definitely ready to bring our A-game." But Canfield picked Australia's Keith Swinton, who reached the final four with a harder earned tiebreaker against defending champion Simone Ferrarese of Italy and France's Mathieu Richard, the 2007 winner, each with 10-8 records. Luna Rossa's Francesco Bruni of Italy, the 2010 winner, clinched the other spot with a solid 12-6 record. With competitors from four countries, it will be a truly international battle. Whoever wins out through the best-of-three semis and the best-of-three finals will need their best efforts to top perhaps the strongest fleet in the event's half-century. Dealing with the first whitecaps of the week built by a more normal southwest Long Beach breeze up to 14 knots, there were six owners of the traditional Crimson Blazers among the 10 skippers from seven nations, but only two - Williams and Bruni - advanced to the sailoffs, along with Canfield and Swinton, who had almost counted himself out after losing his last race to Sweden's Johnie Berntsson, the 2009 winner. Williams, the winner in 2011 and 2012, and Bruni (2010) were 3-1 on the day, Canfield and Swinton a humbling 2-2, as was Richard. Dave Perry (1983 and 1984) was eighth at 5-13. 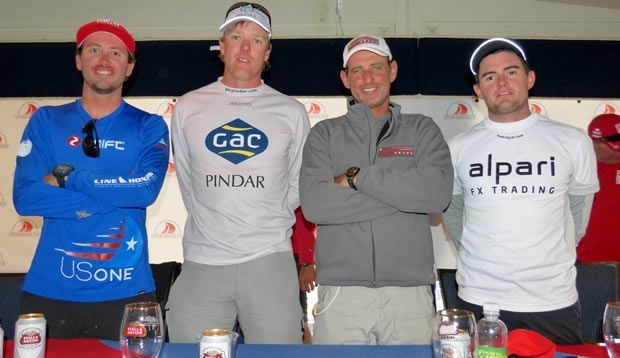 Bruni said, "We are very happy we are through [to the sailoffs]. We have new positions on the team and it's still training for us." The new personnel included tactician Adam Minoprio from New Zealand, formerly a skipper. "Adam did very well," Bruni continued. "The Congressional Cup is always a tough competition but it's now very high. A lot of people have the same faces but more skills." Canfield, twice burdened by double penalty flags on the day, said, "We knew it was going to be like this in this event . . . tough right until the end." 10. Scott Dickson, U.S., 4-14.